Add special effects to your webcam pictures. Is there a better alternative to CamMask? Is CamMask really the best app in Photography category? Will CamMask work good on macOS 10.13.4? CamMask provides your webcam with powerful characteristic functions. It supplies thousands of special effects when you video chat with your friends. And it allows you to output video, image gallery, desktop, gradient / solid to your webcam. You can also graffiti the screen, and even add the text and date. Picture-in-picture and convenient snapshot/recording functions are also supported. Because CamMask uses a virtual webcam driver, you can you use your webcam for several applications, website or flash, simultaneously. This makes it possible for CamMask create at six preset viewports, each one with independent special effects, video sources, and so on. CamMask turns your computer into a video studio as if having multiple webcams. Virtual Webcam Driver, let the CamMask completely integrate into the chat software and allow them work at the same time. Add thousands of incredible special effects into your Webcam pictures. Magic Face changing, suddenly turn into celebrity. Background replacement, Are you still there? No, you can be anywhere after changing the background. Video Doodle, allow you draw anything as you wish in the video-chat picture. Show the date or other text in the video-chat picture. Snapshot/Video manager, Recording precious moment at any time and share with your friends. 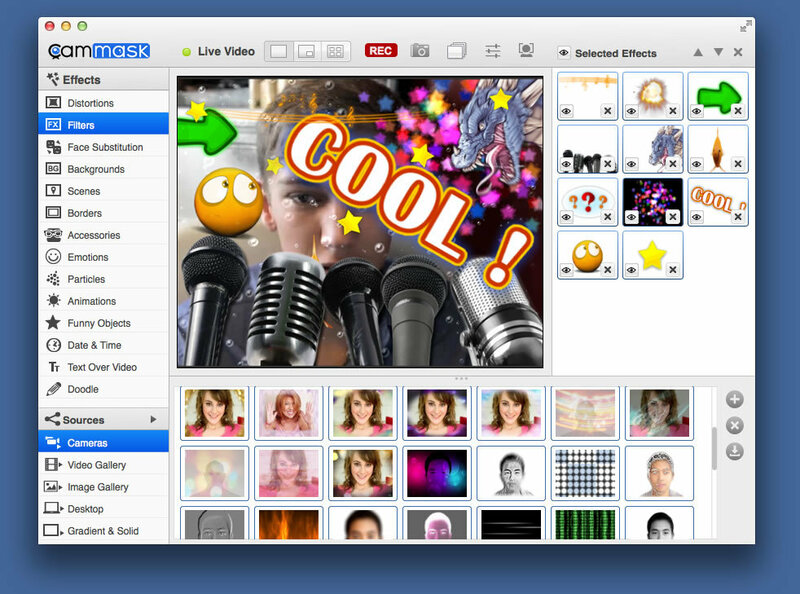 Multiple video sources, convert photo gallery, video, Real-time desktop, Gradient/Solid color to Webcam pictures. Picture in Picture,Output multiple video pictures simultaneously. Allow create Multiple viewports, switch as you wish. Fix the view-item displayed problem when double click to add effects.